Nisus was a king of Megara in Greek mythology; Megara being an ancient city northeast of the Isthmus of Corinth, and historically one of the four districts of Attica. Nisus was one of the four sons of Pandion II of Athens, making Nisus brother to Aegeas, Pallas and Lycos, and possibly one unnamed sister. Nisus and his siblings were not born in Athens though, for their father had been forced into exiled when the throne of Athens was seized by Pandion’s brother Metion's sons. Pandion had found sanctuary in Megara, where King Pylas had welcomed the refugee, and Pylia, the daughter of Pylas had been married to the rightful ruler of Athens. Pylia would bear Pandion his children in Megara. Pandion would actually become king of Megara, for Pylas left his kingdom behind when he went into voluntary exile following a family dispute, and named Pandion as his successor, despite Pylas having a son, Sciron, who had married the daughter of Pandion. When Nisus, Aegeas, Pallas and Lycos came of age, they decided to regain the throne of Athens, and they successfully went to war with the sons of Metion. After the war Aegeas, as the eldest son of Pandion II became king of Athens, though the governing of Attica was said to have been divided amongst the brothers. Thus, Aegeas had Athens, Lycus became king of Euboea, Pallas became ruler of the southern territories of Athens, and Nisus became the new king of Megara. The succession to the throne of Megara was not totally without incident though, for Sciron, the son of Pallas disputed the succession; although an Oracle, or King Aeacus of Aegina, did decide that Nisus was the rightful king, and Sciron was made commander of the Megaran army. In Megara, Nisus would marry Habrote, a princess of the Boeotian kingdom of Onchestus, and sister of Megareus, the son of Onchestus or Poseidon. 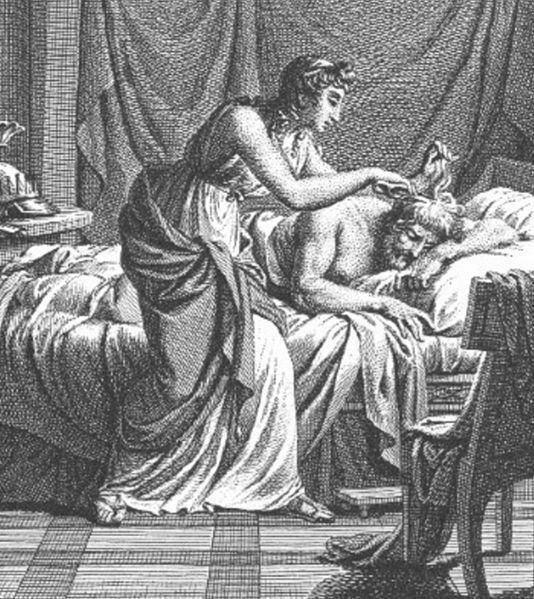 Habrote would bear Nisus three daughters; Eurynome, who later became mother to Bellerophon, Iphinoe, who would wed Megareus, and Scylla, the cause of Nisus’ downfall. At the time when Nisus was king of Megara, the kingdoms of Athens and Crete were in dispute, after Androgeus, the son of King Minos of Crete, had died whilst in Athens, and so King Minos had gone to war. Megara, as an ally of Athens, stood between Minos and Athens, and so Megara was besieged by the forces of Crete. Despite being mortal born, Nisus was protected from harm, because on his head he had a magical lock of purple hair, and Nisus therefore successfully organised the defence of Megara. The treachery of Scylla did her no good though, for Minos rejected her, and Scylla was drowned as she swam after the Cretan fleet. Scylla was then transformed into a small sea bird, and for thereafter, Nisus, as the osprey would chase after the sea bird. Nisus was succeeded as King of Megara by Megareus, who was his brother-in-law and his son-in-law. Megareus had come with an army from Onchestus to assist Nisus, but probably arrived too late.